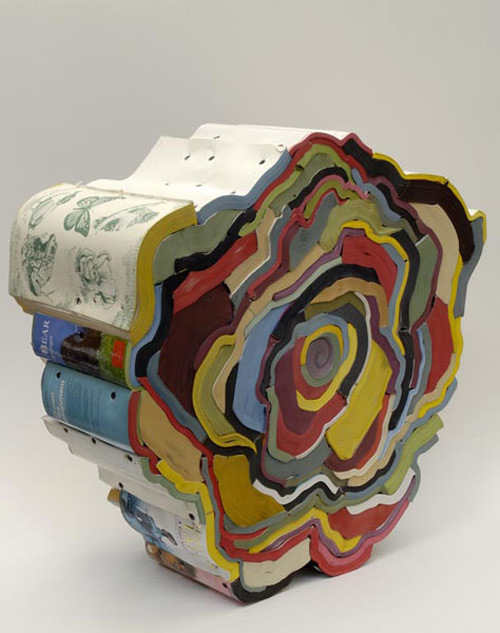 Jonathan Callan is a UK sculptor who mostly works with books and paper. While there’s no polymer clay here (and PCD rarely strays from polymer artists), I’m hoping that you’ll appreciate Callan’s cane brain. His “canes” are made from books and they’re simply fascinating. Could he have been influenced by polymer clay? New ideas are flooding in from fellow artists here in Colorado. I have some lovelies to share with you tomorrow. For now, it’s back to my worktable. Today’s link came from my darling daughter. HMMMMMMMMMMM!!!! I have this big blank wall in my house…now how can I interpret that in clay. My brain is spinning with possibilities. Polymer or not…great link. I appreciated this feature of Jonathan Callan (his piece “The Defrauder” on his website is pretty impressive! ), but moreover, I loved reading your daughter’s blog and spent a long time perusing some of her links (some of which I’ve seen before). I have my sights on ‘living small’, and am working my way toward that end, so loved seeing what she’s doing (bravo! ); I’m so happy to see this movement gaining steam.. I own a lot of clay but I don’t think I can get anywhere near the size of some of his pieces. I see “beads” in everything I see and I definately see beads here. Very interesting. I LOVE your daughter’s blog. I so respect her way of life…it sounds real and full of joy. Thanks for the link to Designboom! There’s a lot to chew on here- reminds me of DaMuse. I use cane scraps to make wild roses and that’s what I thought this was at first glance! Very beautiful; can you imagine what it weights?